NECROFUION Featured in "Internet Horror, Science Fiction and Fantasy Television Series, 1998-2013" by Vincent Terrace. The original 10 Forward Productions animated pilot "NECROFUSION" was written about in a book, recommending it and crediting creators Amit Tishler and Luke Ellison. You can read more about it in "Internet Horror, Science Fiction and Fantasy Television Series, 1998-2013" by entertainment historian Vincent Terrace. Next month 10 Forward Productions will be releasing it's first issue of the independently produced fantasy adventure comic: Tales of Lyla. 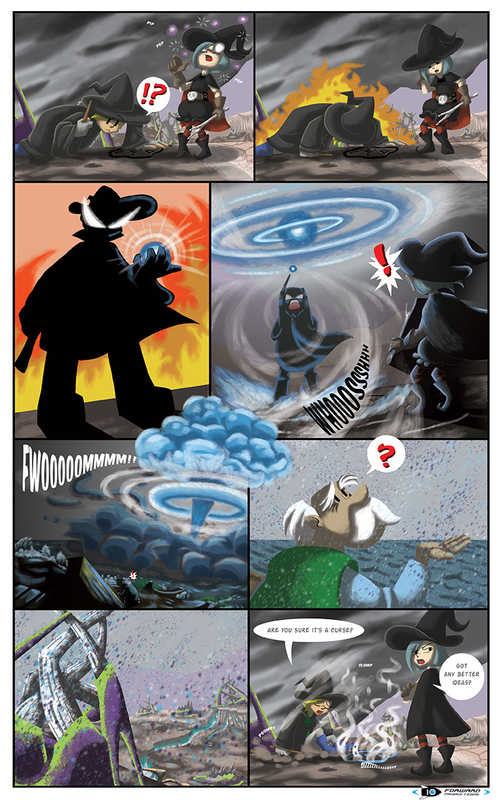 If you like magic, dungeons, dragons, wizards and killer gnomes: 10 Forward's "Tales of Lyla" may be the right comic for you. Different issues will feature a variety of visual styles an will put together an entertaining and exciting over-arcing story, with many stand alone chapters of this well planned quest. The first issue will be available to purchase through Amazon for only 2.99$! (and 99 Cents for a limited time only). A launch date will be announced soon, so stay tuned! In the meanwhile, here is a teaser page from the middle of issue 1. Don't you wanna know what this magical blowout is all about? Written By Amit Tishler and Lisa Wong. All rights for "Tales of Lyla" reserved to 10 Forward Productions, inc.
Luke Ellison - Interview in ""Toledo.com Creative News"